RINSE the leek, remove the outer leaves and chop about 1/4th of the leek in pieces, not too thin. Slice the raw gammon in half. HEAT sunflower or vegetable oil on high heat in a large pan and brown the raw gammon on both sides. ADD the chopped leek and brown some more, on medium heat. POUR water into the pan and bring to a boil. Turn down the heat and let it simmer (with the lid on) for at least an hour, preferably 1,5 hours. 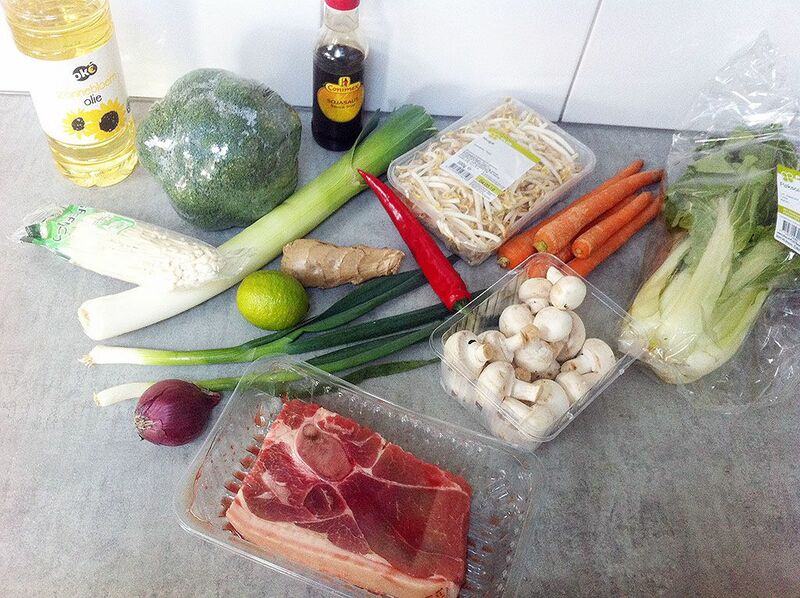 So the stock will become very flavorful. CLEAN the white button mushrooms and cut them into slices. Clean the broccoli and create small florets. PEEL the carrots and slice into thin pieces. RINSE the pak choi and slice into medium-sized pieces. 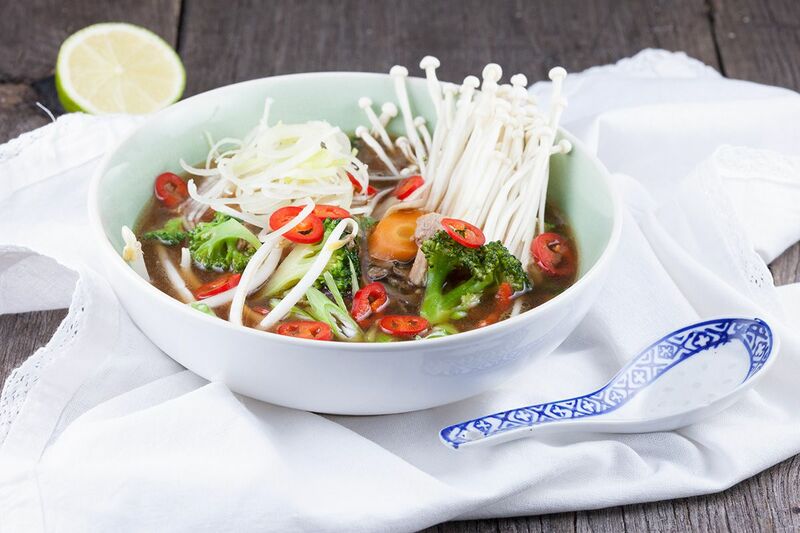 HEAT sunflower or vegetable oil in a medium-sized skillet, then add in the broccoli florets, pak choi, mushroom and carrot slices. COOK them for a few minutes on high heat and set aside. REMOVE the gammon and leek from the broth by using a fine sieve and pouring it into a clean pan. 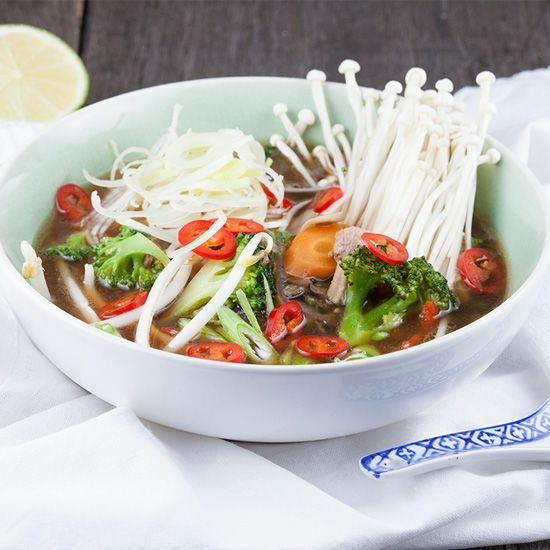 ADD the mushrooms, pak choi, broccoli and carrots and bring back to a boil. GRATE in some ginger root and season with soy sauce, lime juice, pepper and salt. SLICE the leftover piece of leek into thin rings. REMOVE the red pepper seeds and slice the pepper into thin rings. Also slice the scallions into thin rings. 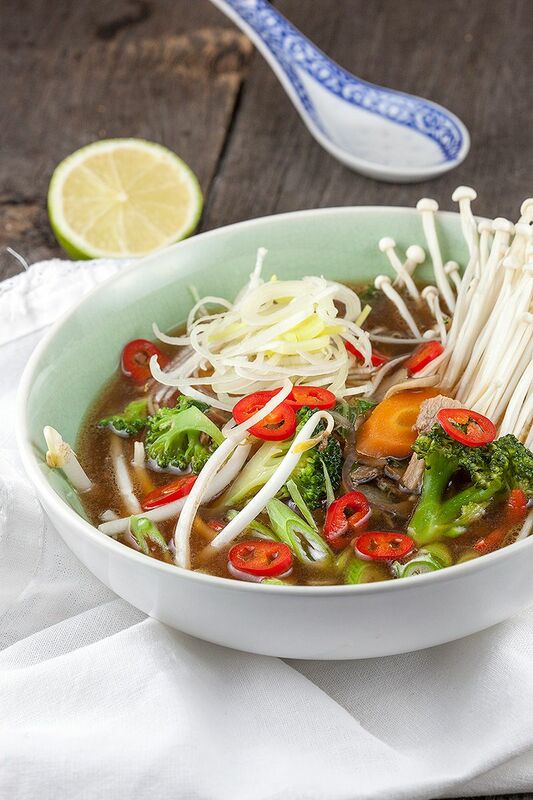 DIVIDE the soup over bowls and FINISH with bean sprouts, scallions, enoki mushrooms, red pepper and leek rings. Enjoy!